The begging started a few months ago… and never stopped. My little dudes were desperately wanting Mommy (that’s me!) 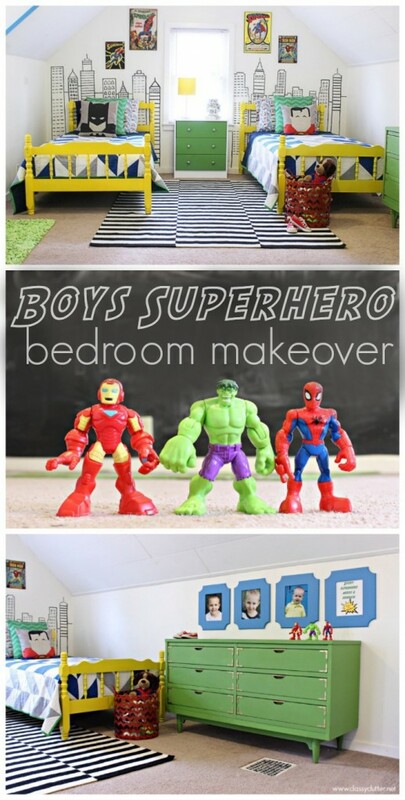 to create a superhero room for them. They wanted Spiderman, Superman, Batman, Hulk and a chalkboard. Well, I’m a big fat pushover and couldn’t resist a room makeover so I started brainstorming and running my ideas by the littles. Here’s what I came up with. Then, I got to work! First, I painted the room a crisp white (Behr – Swiss Coffee) then I decided I wanted a cool design on the wall behind their beds. After some brainstorming, I decided I wanted a hand drawn city skyline so I started painting. I just wanted random buildings and almost a graffiti style to it. I wanted it a bit messy but fun looking. My kids thought it was the coolest thing ever and played with their superhero figurines in front of it for hours. The nightstand is the Ikea Rast and I painted it and added new knobs. The little robot and the lamp are from Target and the Superhero art above the skyline is from Hobby Lobby. They have some pretty cool comic book inspired art. My boys love it! Next, I spray painted the beds (that used to be navy blue) a bright glossy yellow (Krylon Sun Yellow) to match the Jenny Lind inspiration beds. The Jenny Lind beds are $600 from Land of Nod and mine cost me $20 each on Craigslist. Heck yeah! I made the back two pillows (tutorials coming soon) and the Superman and Batman pillows came from Geek and the Chic on Etsy. I love the high gloss look and the yellow is so happy! Next, we brought in the kelly green campaign dresser I did for the Pixelated Wall during Creating with the Stars. I love this dresser so much! Also got this one at a bargain for $10. The frames are the “Parker” frame from Cut it Out Frames. 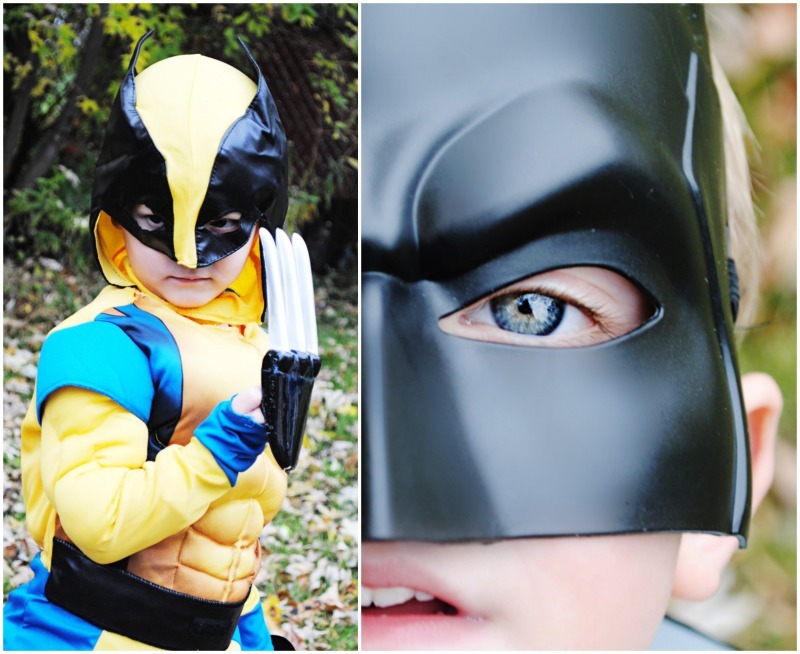 There is one frame for each of my boys and the last one says “Every Superhero needs a sidekick – Reserved for Palmer”. It’s for my little baby boy that will be here any day now! I can’t wait to meet him and get his picture in the frame by his big brothers. My boys’ made these super cute puppy dog superheroes at Build a Bear and I think Spiderman pup is just too cute! The basket holds a few of their stuffed animals. It was clearance find from Hobby Lobby. 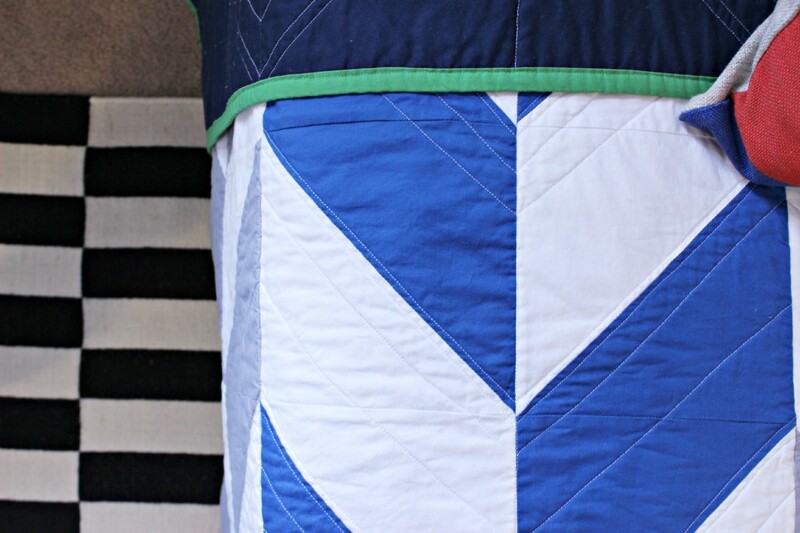 These absolutely amazing quilts are from KB Cute. 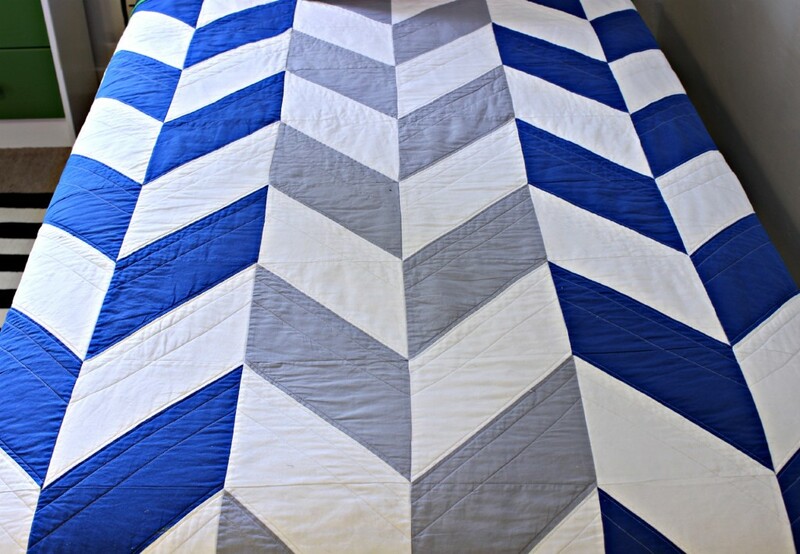 Our sweet friend, Kerri of KB Cute makes both custom and premade quilts and crib sheets on her shop. I gave her my design ideas, color choices and I couldn’t believe how fast she whipped these up and they’re exactly what I’d hoped for. Her work is impeccable and she is so creative and on trend. Her quilts are truly an investment piece that will sure to be a family heirloom that will be passed down. The green trim and the herringbone pattern are just too cute for words and can grow with the boys. She is insanely talented. If you need any quilts or crib sheets, she’s your girl. She has a bunch in her shop for sale but her custom work is what sets her apart from the rest. She will create exactly what you need for your little one! Check out her shop here. Oh, her Instagram feed is drool-worthy too! Follow her @kb_cute. 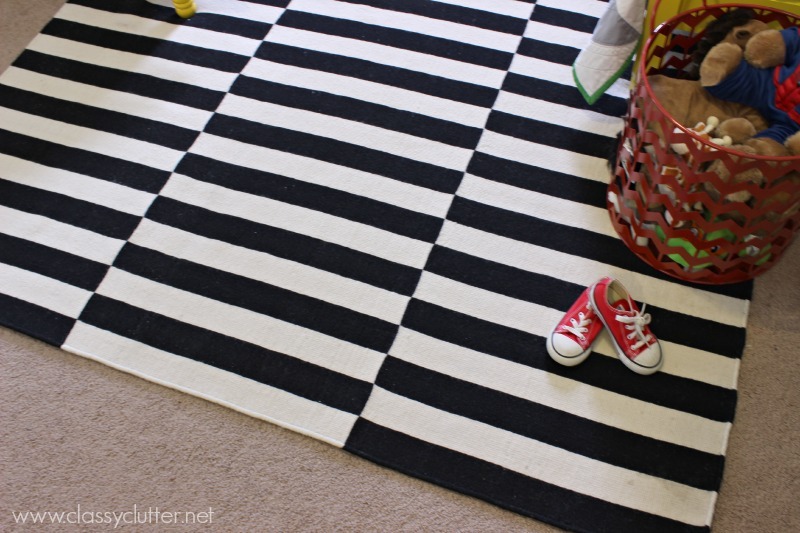 This fun striped rug came from Ikea. I love a pop of black in white in any room! Time for the little dude’s baby nook. I painted the trim (except the baseboards) a bright blue that I had on hand. It’s an Oops paint I got from Home Depot. 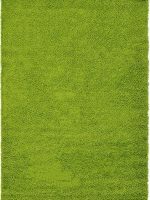 I love the mistints in Home Depot because you always get super fun colors for a steal of a deal. The container cost me $.50! I love the pop of color it adds. 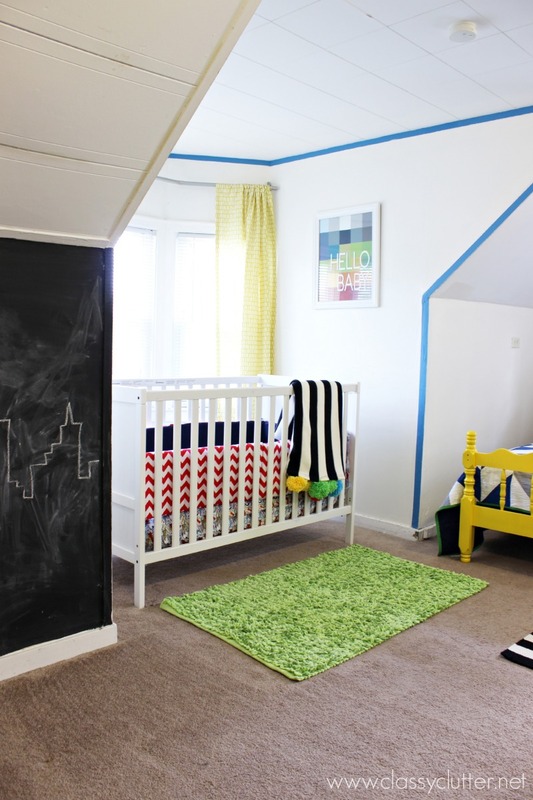 The green rug and yellow curtains are from Target and the crib is from Ikea. 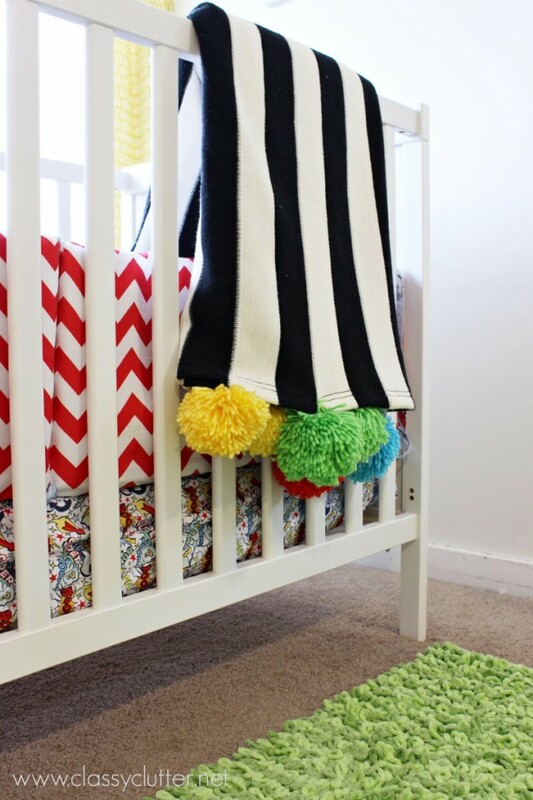 This cute little black and white striped throw is also from Ikea but I added these funky colored pom poms. I made the chevron bumpers for my last little boy, Tanner and I’m excited to have them out again for baby boy #4. 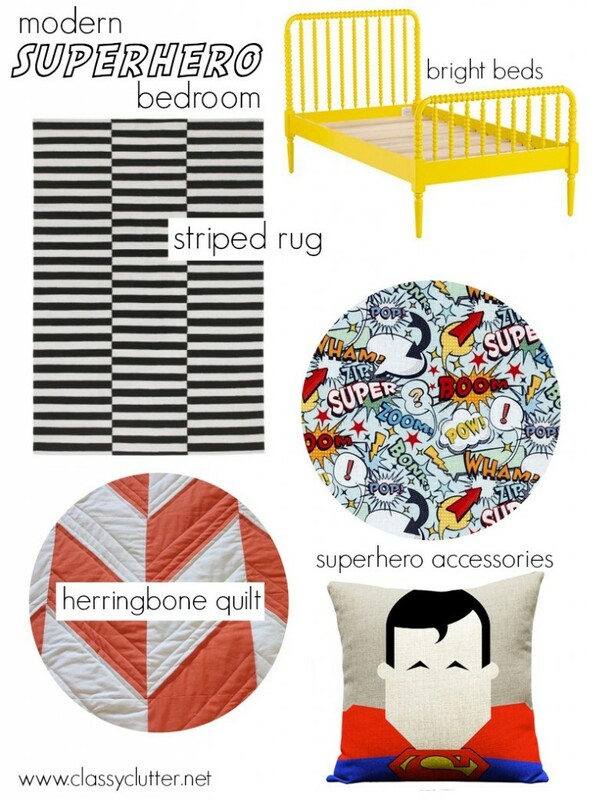 Kerri also made this adorable superhero crib sheet for the baby and I loooove how it ties in with the big boys’ bedding. The one request the boys had was a chalkboard so we made a giant one! I will have a full tutorial on how to turn an interior wall into a giant chalkboard real soon! Of course we had to draw a superhero scene on it! Too cute! What a fun room. Love the bright colors and the way you brought it all together! So this is adorable. I’m in love with the skyscraper wall and thinking it might be the perfect addition to your city + suburb + sanity world! Also… are you honestly planning to put 3 boys in the same room?! With the baby?! Brave, brave lady. Finally…. pretty sure our kids would have a blast together so whomp whomp we’re not closer! It turned out AMAZING Mallory! My boys would LOVE that room! Good work lady! I LOVE it! Great job girl! This is giving me so much inspiration for the vintage superhero room makeover I’m doing for Kaison. 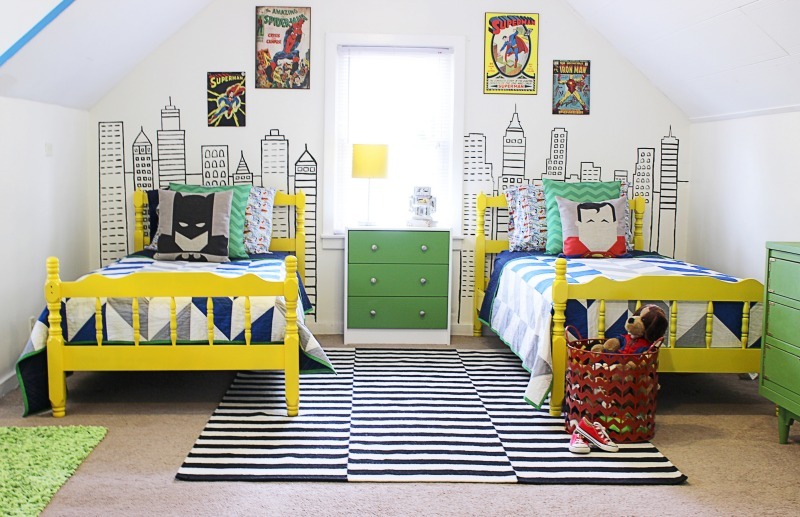 Seriously the cutest kid room I have EVER seen!!! Amazing!! Can’t show my son b/c he will beg me for it and I *just* finished his Dr Seuss room! 😉 You girls have the decorating golden touch! Super cute. I love the theme but it isn’t too over the top. Great job! 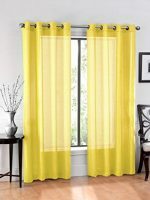 Love this bright, fun room! 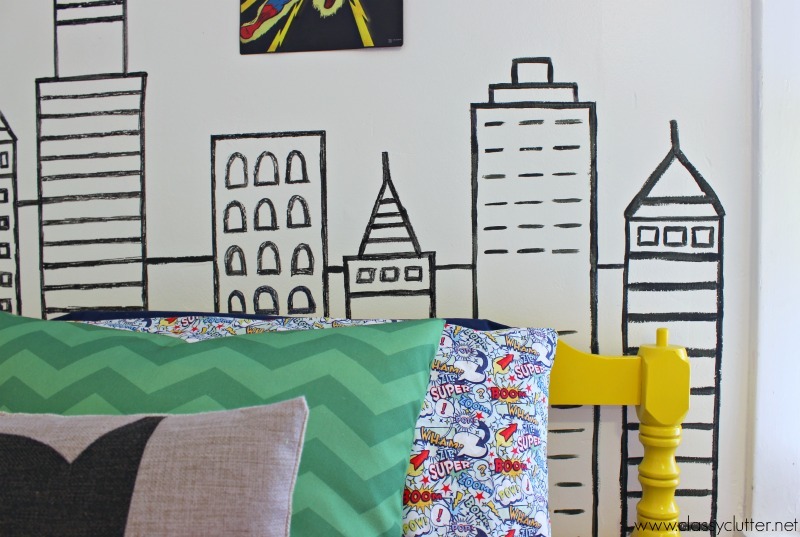 Especially the city skyline mural and the sweet little frame reserved for the new baby. And your deal hunting is phenomenal! I’m wondering if all four of your boys share this room and if so how that is working? Well, at least for the three present. I have been wanting to spray paint my boys painted bunk beds too. Did you have to sand or anything before or did you just start spraying? Thanks! This is ridiculously cute! I’m not usually one for characters BUT THIS I can do (and since I’m mama to a 1yo boy I better get use to it!) I love, love, love the skycrapers and your modern taste on the theme. Wonderful job!! I LOVE this room! I read your post a few days ago in my reader, and made a mental note to come back to leave a comment and pin a bunch of images. Love that it’s so fresh and fun yet can grow with the boys for a while…and be easily changed when (and if!) they ever tire of super heroes! Love it – great details, and it just came together so wonderfully! Congrats! What a great room, love how all the components work amazingly well together. The skyline scene is fantastic! Love this!!! Going to steal this for my two superhero loving daughters. Wow – I LOVE it!! 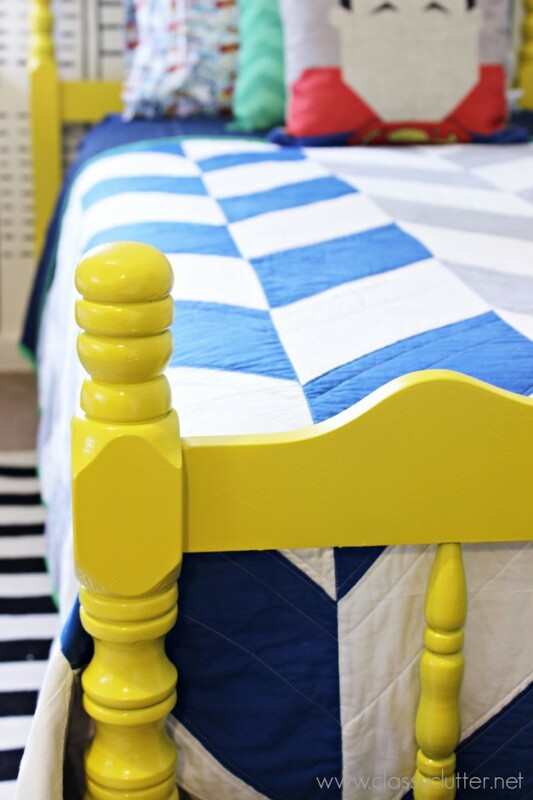 Those bright yellow beds are perfect – and I have that exact same rug for my boys’ room! Love the hand-painted skyline. Brilliant! So Very Cute! You did a terrific job! How lucky your little boys are to have such a talented Mommy. Too Cute! What color green did you use? You girls are just amazing! This room is so so cool. Every detail is just perfect. You seriously blow my mind with every room reveal! Love these bedroom design ideas, but I think it is more suitable for boys. This looks incredible!! Is there such thing as superhero chic? I also just finished a room using the Jenny Lind twin bed. I too chose a super bright color. I thought I was so clever…I was trying to find a good price to price out the room and that is when I found the Land of Nod bed. Almost the exact same color as mine! –but I paid $15 at Goodwill. 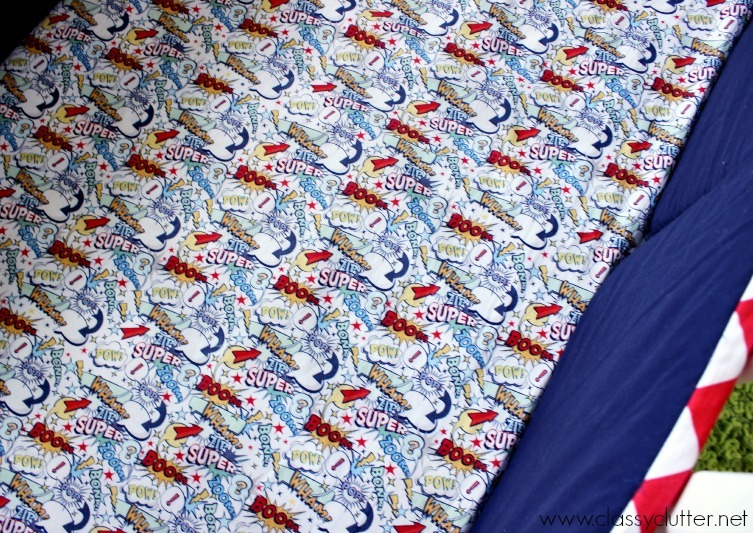 This is too cute… I also finished twin super hero bedding set, after seen this amazing decors. I thought to share what i made. Wow!! I love it. My son is also crazy about superheroes, this room will make him happy. I am going to share this with him today! What an an amazing project. Mallory and Savannah this is so creative! The skyscraper wall is fabulous! Love the hot yellow against the black and and white. 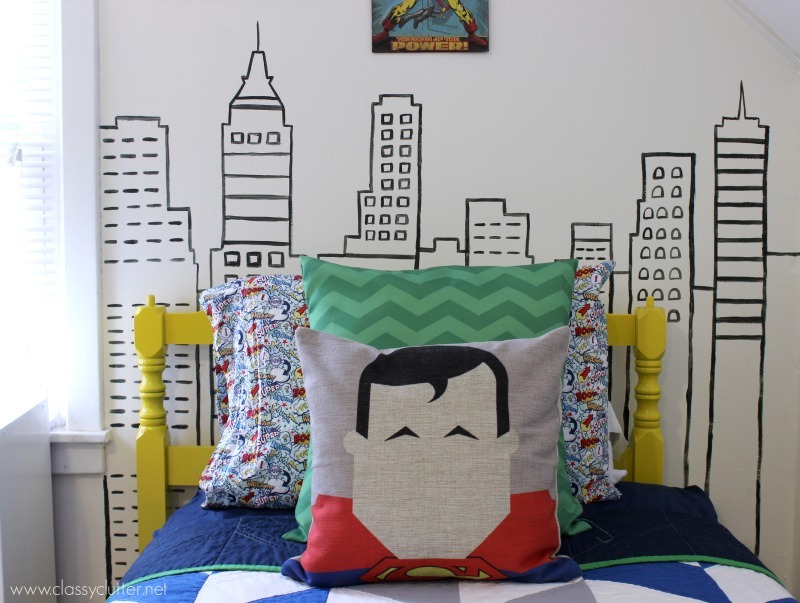 What you’ve done has inspired us to produce a range of superhero wall graphics! Thanks for sharing! Great decorating idea! Now my boys will surely like this idea of redesigning their rooms. I like the color combination and the wall paintings. LOVE this so much!!! Just pinned!! 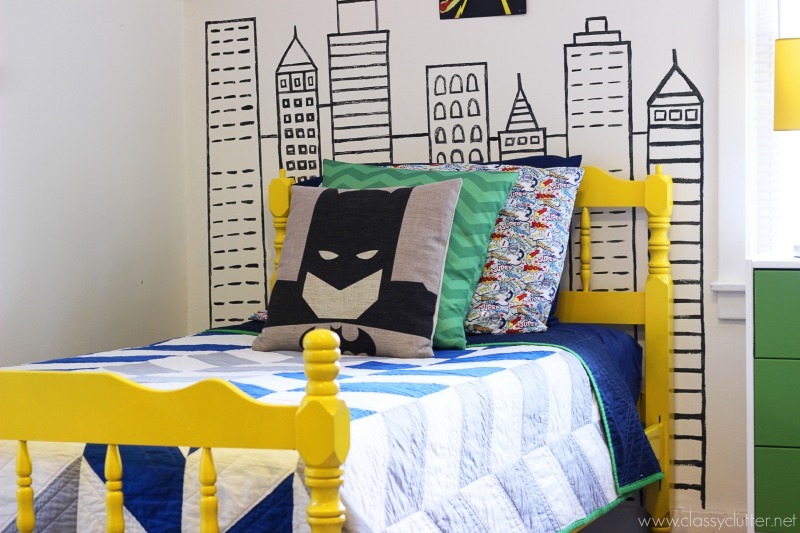 I am copying your ideas for my boys’ bedroom!! I love the modern look! Would you mind sharing the green paint color that you used on the nightstand? La habitación resultó increíble! Me encanta como queda el azul con el verde – el tono adecuado y todo salió tan bien juntos. Siéntase orgulloso de lo que ha logrado y qué estás haciendo esto es muy inspirador. 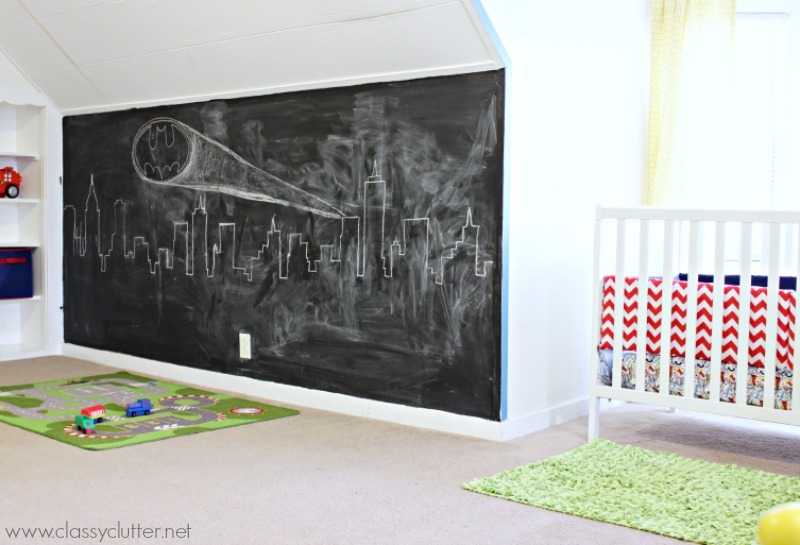 Is the city skyscape a decal, or painted on the chalkboard wall?love it!!! Hi! 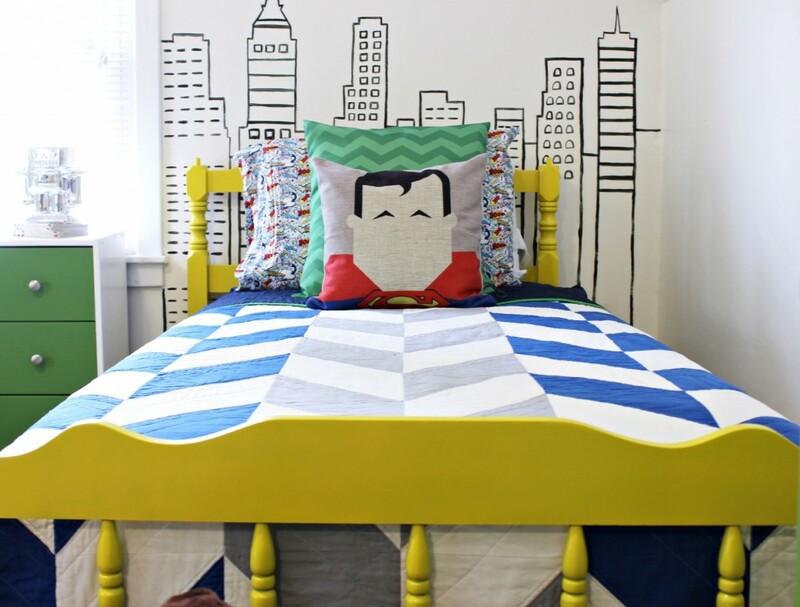 The cityscape behind the beds was just hand painted free hand and on the chalkboard wall, I just drew that with chalk! Hope that helps! Ok, so I am in love with this. 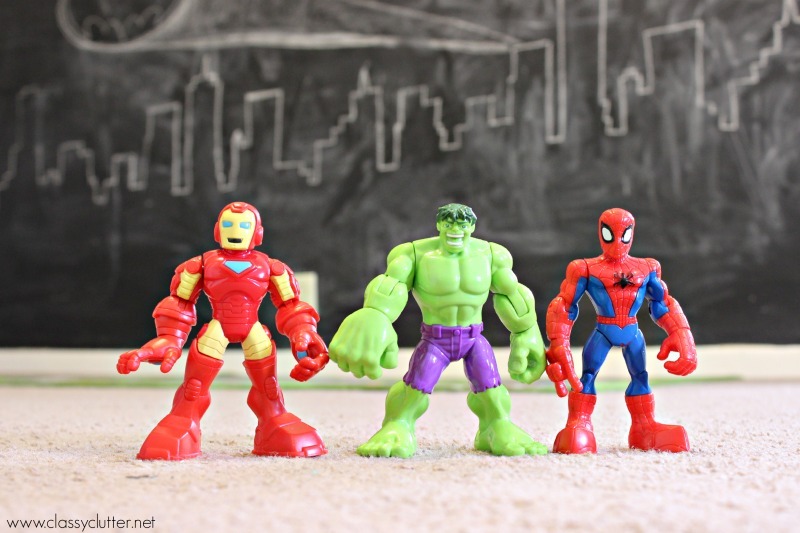 With every picture I kept thinking, “just stop it, too much cute.” Forget the sports theme for my son’s room, he is totally getting a superhero room now! Thanks for the inspiration, now I’m off to craigslist to hunt for some spray-paintable bargains! Thanks Audrey! You’re so sweet! Hi, I LOVE this! Can you please tell me where the cute Sperhero fabric you used for the back cushions and cot sheets is from? I think this room is super cute and especially liked the character pillows–those were really inventive! I just wanted to point out, though, that not every girl is into stereotypical pink and pretty princesses. 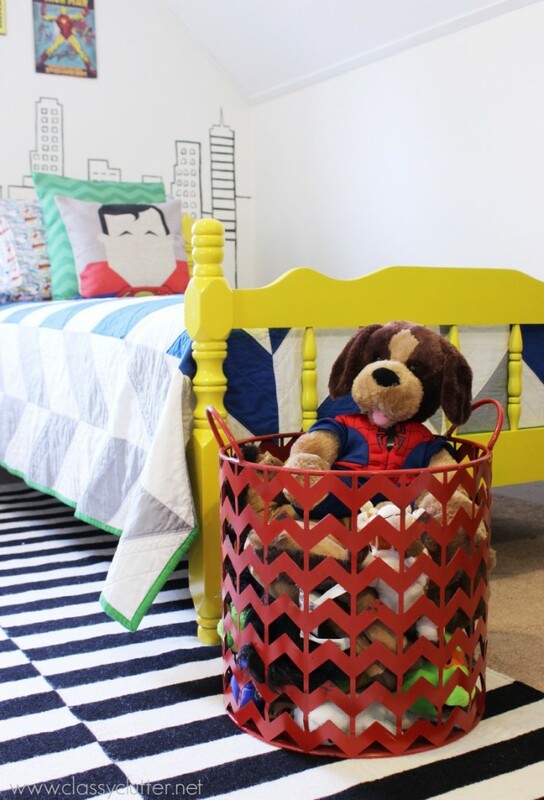 Lots of girls love strong primary colors and superheroes too! My daughter loved Superman from the time she was a toddler, then Wonder Woman (she had a Wonder Woman-themed bedroom that was adorable), The Avengers, Spiderman, etc. Just a thought, and not meaning to offend, but why say something like this is boys-only when girls might love it too? Hi Kristine! I definitely don’t want to offend anyone. I only called it a Boys room because I created it for *my* 4 little boys in my own home. It could definitely go either way. I definitely did not say or imply that this is for boys only. I totally agree with you. Thanks for stopping by! Oh, dear, I didn’t mean to sound like I was offended, because I totally wasn’t. I do apologize if my comment sounded that way.The room really is super (I adore all the little details you put in! ), and I bet your boys just love it. What a nice mom you are to make their wishes come true. I just happened to have once been that little girl who loved Barbies and my dollhouse, but also my Tonka Trucks and superheroes. My daughter was the same. I’m a Baby Boomer, from a time when there was a lot of pressure to conform, and I’ll always be grateful to my mom the she didn’t try to fit me into that narrow box of “things that are appropriate for girls,” but let me explore my imagination and play with anything I found fun. One of my favorite pins from Pinterest is of a little girl who couldn’t decide between a princess party and a Thor party for her birthday, so her mom made her a Princess Thor costume with a tutu and a magical hammer–that was a mother after my own heart! Thank you for sharing the fun project with us all!. 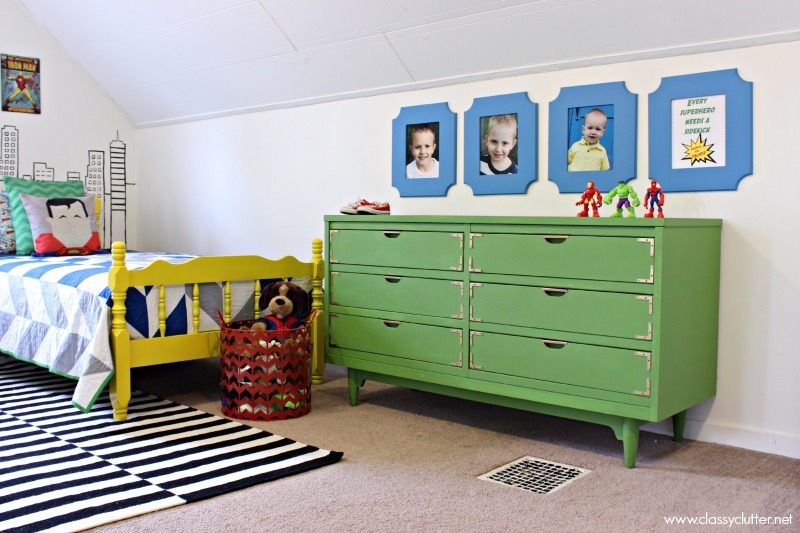 What color/brand of green did you use for the nightstand and dresser for the superhero room? I am sorry I don’t remember what the color of green I used. Do you know what happened to the etsy shop you used for the pillows? Looks like they’re gone. They’re no longer in business! SO SAD!!! !